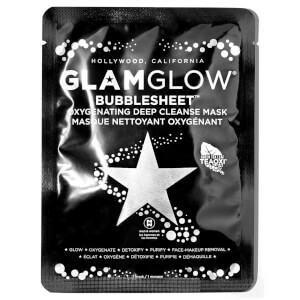 Treat your pout to the GLAMGLOW Poutmud™ Wet Lip Balm Treatment Mini; an ultra-hydrating formula that works to soften and condition lips. Infused with Sweet Almond Oil, Shea Butter and Kombucha Extract, the deeply nourishing balm replenishes and regenerates dry lips, whilst its dose of TEAOXI® Moroccan Mint Leaf delivers a sweet and minty treat. Expect smooth, comfortable lips with a hint of colour. Polyisobutene, Caprylic/Capric Triglyceride, Olea Europaea (Olive) Fruit Oil, Prunus Amygdalus Dulcis (Sweet Almond) Oil, Simmondsia Chinensis (Jojoba) Seed Oil, Beeswax\Cera Alba\Cire D'abeille, Bis-Diglyceryl Polyacyladipate-2, Hydrogenated Castor Oil, Ricinus Communis (Castor) Seed Oil, Euphorbia Cerifera (Candelilla) Wax\Candelilla Cera\Cire De Candelilla, Synthetic Beeswax, Stevia Rebaudiana Extract, Butylene/Ethylene/Styrene Copolymer, Helianthus Annuus (Sunflower) Seed Oil, Mentha Viridis (Spearmint) Leaf Oil, Hdi/Trimethylol Hexyllactone Crosspolymer, Honey\Mel\Miel, Hibiscus Sabdariffa Flower Extract, Moroccan Lava Clay, Saccharomyces/Xylinum/Black Tea Ferment, Ethylene/Propylene/Styrene Copolymer, Malpighia Glabra (Acerola) Fruit Extract, Paullinia Cupana Seed Extract, Euterpe Oleracea Fruit Extract, Butyrospermum Parkii (Shea Butter), Pyrus Malus (Apple) Fruit Extract, Cocos Nucifera (Coconut) Oil, Orbignya Oleifera (Babassu) Seed Oil, Theobroma Grandiflorum Seed Butter, Calophyllum Tacamahaca Seed Oil, Nephelium Lappaceum Branch/Fruit/Leaf Extract, Annona Cherimola Fruit Extract, Sodium Hyaluronate, Astrocaryum Murumuru Seed Butter, Gardenia Taitensis (Tiare) Flower Extract, Caprylyl Glycol, Psidium Guajava (Guava) Fruit Extract, Averrhoa Carambola Fruit Extract, Garcinia Mangostana Fruit Extract, Ethylhexylglycerin, Litchi Chinensis Fruit Extract, Silica, Water\Aqua\Eau, Glycerin, Maltodextrin, Hexylene Glycol, Flavor (Aroma), Limonene, Linalool, Tetrahexyldecyl Ascorbate, Citric Acid, Phenoxyethanol, [+/- Mica, Titanium Dioxide (Ci 77891), Iron Oxides (Ci 77491), Iron Oxides (Ci 77492), Iron Oxides (Ci 77499), Bismuth Oxychloride (Ci 77163), Blue 1 (Ci 42090), Blue 1 Lake (Ci 42090), Bronze Powder (Ci 77400), Manganese Violet (Ci 77742), Red 6 (Ci 15850), Red 7 (Ci 15850), Red 7 Lake (Ci 15850), Red 21 (Ci 45380), Red 22 (Ci 45380), Red 27 (Ci 45410), Red 28 (Ci 45410), Red 28 Lake (Ci 45410), Red 30 Lake (Ci 73360), Red 33 (Ci 17200), Red 33 Lake (Ci 17200), Yellow 5 (Ci 19140), Yellow 5 Lake (Ci 19140), Yellow 6 (Ci 15985), Yellow 6 Lake (Ci 15985)].